The Bulova Corporation was founded in 1875 by Czech immigrant Joseph Bulova in a small premises on Maiden Lane, New York City. By 1911, Joseph Bulova had set up manufacturing to build high quality boudoir clocks, table clocks and pocket watches and by the following year (1912) Joseph Bulova was able to establish his first dedicated Watch manufacturing and assembly plant in Bienne, Switzerland, building only quality fully jeweled movements. So, where are these 'Bulova Watches' Dating from 1911 to 1921 You may ask? The clues are right before Us. The first clue was recently discoverd in an ad which appeared in a 1922 Cosmopolitan Magazine. Makers of the famous HUDSON MAXIM and RUBAIYAT Watches. The image appears to be Copyrighted 1920 or 1921 and there is no mention of Bulova Watch Co in fact to the contary, the ad reads J. Bulova Co. In 1917 a Patent was issued to the J. Bulova Co. The Watch shown above is a First World War era (WWI 1914 - 1918) Gent's wrist Watch, correctly Jeweled (7) for Military issue at the time, manufactured in Switzerland, signed on both Case and Movement Rubaiyat W. Co. in the very same fashion, identically even, to early movements signed Bulova W. Co., which appear around 1921. Also please note the Rubaiyat signature on the Movement rolls the same way depicted in the Patent issued to J. Bulova Co. It is My contention that this Rubaiyat W Co. signed piece is the early work of Joseph Bulova manufactured while operating as the J. Bulova Co. pre Bulova Watch Company and the reason We do not see any 'Bulova Watches' pre Dating the early 1920's is that they do not exist. They do, only during the Decade of 1911-1921 Mr Joseph Bulova of the J. Bulova Co was manufacturing His famous Watches from the facility in Bienne, Switzerland under the Names of 'Rubaiyat' and 'Maxim' as indicated by the early 1920's ad. This contention would also help explain early 1920's Watches which are American Standard Cased Bulova signed Movements with Maxim, Rubaiyat or nothing at all printed on their Dials, as J. Bulova Co grew and morphed into Bulova Watch Company, casing and timing Watches downstairs from the newly constructed Bulova observatory on Fifth Avenue, New York. Many thanks to Mr Stephen Oilman, owner/admin of MyBulova.com for allowing the presentation of this information on site and to fellow MyBulova members who take time to read, evaluate, enjoy or critique. No criticisms from me. A very well thought out and presented piece, Mark. I totally go with this, as, if granted the trademark name in 1917, when did he actually apply? In all probability it wasn't awarded immediately, and could have had to wait for several years, but in the meantime carried on making watches with this name. Rubaiyat a pre-Bulova branded watch...we see several of them.... Good stuff. So is it fair to say that both the Hudsin Maxim and Lady Maxim are also early Bulova made watches? I've always contended that the answer is 'yes'. This is a great find and I hope something that we can expand on in the future with more adverts from this era. I have another 1922 advert heading my way that also states the compnay name of J Bulova Company and not Bulova Watch Company. So it would appear that they started to trade under the BWC name either in late 1922 or 1923 as we have dated 1923 adverts using the Bulova Watch Company name. This name change I think explains a lot about that transitional period we see in how Bulova labelled their very early watches. "So is it fair to say that both the Hudsin Maxim and Lady Maxim are also early Bulova made watches?" There was a Watch named the 'Hudson Maxim' which is depicted at a J. Bulova Co. display booth at a convention. The image is from a Jewelers circular Dated 1921. "Makers of the famous Hudson, Maxim and Rubaiyat Watches". Swiss Movement signed Hudson W. Co.
Undoubtably the 'Rubaiyat W Co' Watch shown in the OP was manufactured by J. Bulova Co. an early Bulova Watch. Note how the RUBAIYAT signature patented by Joseph Bulova rolls, almost like a Wave. On April 14, 1912 The R.M.S. Titanic struck an iceburg and sank in the Atlantic Ocean - 'The luxury liner was carrying several works of art. Among the most famous was "The Rubaiyat," a compilation of poems written by Persian astronomer and mathematician Omar Khayyam in the 11th Century. The copy of the book had a binding that included more than 1,000 gem stones'. Excellent digging, Mark. Gotta love when it all starts to come together. I have a listing for Rubaiyat dating to November 1916 in Biel Switzerland by J. Bulova & Cie, perhaps this is the applied for date. So, the Rubaiyat could possibly Date to as early 1916 +/-. We need to be keeping an eye out for early Hudson, Rubaiyat & Maxim watch ad's/info, there may be more clues to be found! I have seen some early J. Bulova Co. ad's, but the only rings were featured. The WW1 Medal belonged to My Grandfather and was issued to British Soldiers for Service. The Rubaiyat is shown as found. It's not clear if the 1922 Cosmopolitan ad is indicating the Hudson and the Maxim were 2 Companies but indications point in that direction. Three people are mentioned in the Bulova-Henshel ppg: Harry Henshel, M.M. Kolish and L.S. Shoen. This entire publication is available for free download as a Google Book. It's good reading. Two pictures of Joseph Bulova - in 1877, a couple years after founding J. Bulova In New York City, and as an older man at the bench. Fact. 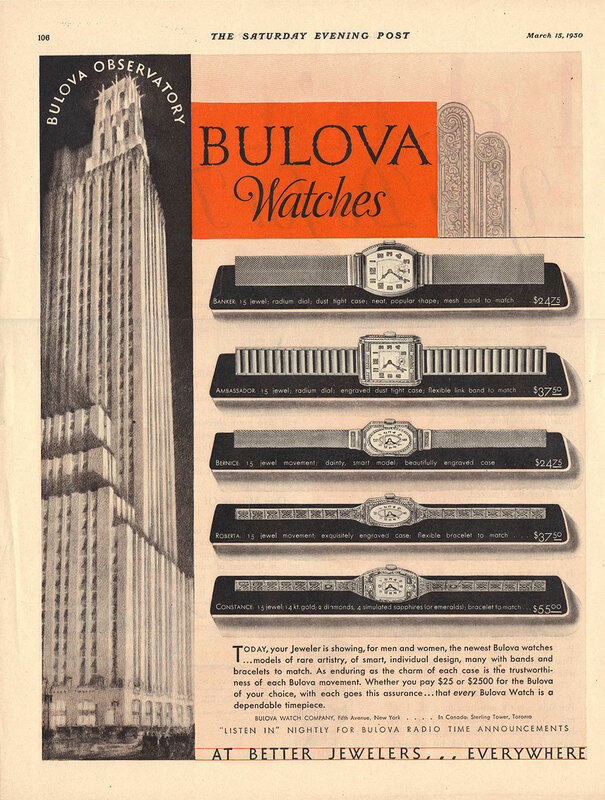 Bulova loved associating famous people with their watches.They have been innovative marketers from the early days. This is what set them apart from other watch companies. I'm still on the fence. I want to believe that in the early days (pre 1921) Bulova were starting out their wrist and pocket watch business by promoting watches baring celebrity names rather than their own, which at that time may not have been well know in the watch industry. The ealiest advert he have is 1922 so we may never know how they started advertising their watchs pre this period. Its is my theory that they where getting blank movements from the Swiss, stampinng them Bulova, then using 3rd party casing companies and marketing then the best way they could. Hudson Maxim was extremely well known at this time so why not use his name to market a watch. It wouldn't be the first time Bulova has done this. What would be nice is some confirmation that Hudson has a connection with Bulova. Another thing we also see time and time again is the release of a Ms version...often called 'Lady' something. Again history has repeated itself time and time again with Bulova. In the discussion regarding the 'LADY MAXIM' on site http://www.mybulova.com/watches/1924-lady-maxim-2458 I'd mentioned finding information indicating 'MAXIM' was an independant Watch making Company, so the MAXIM Company did exist. The HUDSON W. Co also existed. Most definately J. Bulova Co manufactured the 'HUDSON MAXIM'. The intro to the Bulova section starts "Standardized imported watches were to be seen at the booth of the J. Bulova Co of New York. The Hudson-Maxim watch was featured at this booth, as was also the Rubaiyat watch"
A curious thing. The same entry I have for the Swiss patent for Rubaiyat mentions a US registration for 1942. It could be that the Rubaiyat watches were sold only in Europe prior to 1942. Also, 1942 is a bit late to be using the Rubaiyat name in the US, are there even any examples of this? Bulova owned the factory(s) in Switzerland that manufactured ebauches for their watches. An ebauche is a raw movt, and can be modified to a particular finished design. 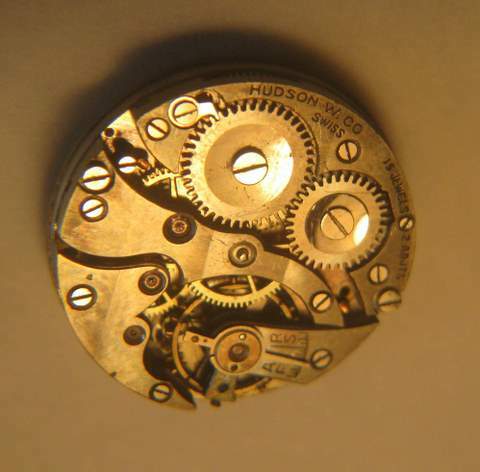 The US factory made plates, dials, and escapements that were fitted to these, and other ebauches, which Bulova purchased from various leading ebauche manufactures, like ETA, FHF, Felsa, A.Schild, Aurore-Villeret, Sonceboz, Glycine, Peseux, Unitas, FEF (Fleurier), Le Phare, Junghans (alarm), Gruen, Venus, Michel, Liengme, Recta, and possibly others. The ebauches from Gruen were of the famed Aegler company, jointly owned by Rolex, Gruen and Aegler. In 1930, Bulova was manufacturing components, that is, plates, dials and escapements in the US at their factory. By about 1940, Bulova was manufacturing complete watches, and by the early 1950s, they were producing over a million watches per year, approximately half being imported Swiss, and half Domestic (US). It seems the watches were always cased and assembled in the US. The cases, as we know, were sourced from various casemakers. So Bulova did indeed use US made in-house movts as well as Swiss in-house movts, but these are in the minority. Keep in mind, a lot of major compnanies like Rolex, Breitling, and Panerai only started producing their own in house calibres relatively recently. Panerai, for example, once famously used a Rolex movt in their watches, but it was sourced by Rolex from Cortebert. Going backwards in time I think We should look at/for the Maxim Watch Co and the Hudson Watch Co. I'm finding the name Maxim trademarked by Bulova, but there are other Maxim Watches (including by Waltham) and also Hudson Watch Co.'s not attributable to Bulova, they are separate companies owned by others. I'm coming up blank for Hudson-Maxim. edit: I see that Hudson Maxim was the inventor of the explosive Maximite, and if this watch is named after him, I'm guessing it is a model name, rather than a Company Bulova may have owned or run. "Bulova was founded and incorporated as the J. Bulova Company in 1875 by Joseph Bulova Joseph Bulova (1851 - November 18, 1935). It was reincorporated under the name Bulova Watch Company in 1923"
That ties in perfectly with my earlier comment above regarding the cross over in vintage adverts from J Bulova Company to Bulova Watch Company. So now we have evidence that the Bulova Watch Company did not start trading under this name until 1923. 1922, 23 and 24 seem to be the years when Bulova really started to get their act together and become a driving force in the watch market. After some exhaustive digging, I am convinced that the Hudson Maxim watch is named after Hudson Maxim. I find no evidence of a Bulova related Maxim Watch Co, nor a Hudson Watch Co relating to Bulova either. Hudson Maxim was from a famous family, and a US super-patriot, a much-loved inventor and media savvy personality. He invented Maximite, an explosive, and also smokeless powder. (As a former gunsmith, I should have remembered that) His brother Hiram Stevens Maxim invented the Maxim gun, and his nephew Hiram Percy Maxim invented the Maxim silencer. There were several Hudson Watch Co's in Europe prior to the 20th century and up to the 1930's. None were in any way related to Bulova. Hudson was a model name used by others, also, as was Maxim. What a great piece of work. You are all to be thanked and congratulated for the time and effort put into digging out this invaluable info. It just keeps getting better every day. In 1951 Ardie Bulova presented a Sundial to the Botanical Gardens in Queens NY. If I may quote from it - "the best is yet to be"
Biel, La Chaux-de-Fonds, Schweiz; New York, USA. No Date is given although I do find it interesting that J. Bulova Co. Bienne, Switzerland is noted. The Date of this MAXIM trademark is a key piece of information. Ok this new advert cements two very topically points that have been discussed here on myBulova.com over the last year or so. Did Bulova make the Lady Maxim? Did Bulova make early Bulova watches without 'Bulova' on the dial? The answer to both questions is a definitive "YES"
U.S. Patent Office document below Dated 1948 indicates Rubaiyat as being 'in use' since November 1, 1916 by J. Bulova Co.
That now gives us a date period when these were in production or at the very least confirmation that Bulova owned this brand. A liitle more about the origins of J. Bulova Co. The image is Artist John Mackie Falconers' rendition of what was 55-59 Maiden Ln. New York. 57 Maiden Lane being the address of Joseph Bulova in 1875. The rectangular sign which is centrally located in the image next to the Road states '59 Toys', a Toy shop which would make 55-57 Maiden Lane on the left the property of J. Rucklass -Tailor. This locale is at the Corner of Maiden Lane and Williams St. where the Federal Reserve building now stands. The origins of Maiden Lane. "Where Maiden Lane is there was once a narrow stream or spring water, which flowed from about the present Nassau Street. Women went there to wash their clothing, so that it came to be called the Virgin's Path, and from that the Maiden's Lane." above excerpt from the book: Nooks and Corners of Old New York by Charles Hemstreet. Mr. T. Jefferson Esq. from June 2nd. 1790 until Sept. 1st. same year. "His house, located at 57 Maiden Lane, was rented from Robert and Peter Bruce, grocers at 3 Front Street, "for 100 pounds per year." St. John de Crevecoeur wrote that Jefferson "lived in a mean house in Maiden Lane and not approving much of the stiff style and etiquette of New York he gave up all his time to the establishment of his new department, foreign affairs, and home. "To his home he added a multi-windowed gallery in the back for his papers, books, and plants. A plaque erected in 1921 by the Home Insurance Company commemorates Jefferson's place of residence in the former capital." Jefferson lives there three months and gets a plaque. Bulova was there for quite a while, and nothing. Boy these historians need to get their priorities straight. So Bulova was "busy" early on. There are several "Bulova Company Reports" from the early 1920"s which are digitized by various US research Library reserve collections. Some of these reports can be found via Google Books. While the actual repots to shareholders, company reports, etc are completely digitized, only "snippets" of the reports come up via Google Books. In most examples, the inside cover is visible, along with then name of the library reserve section which has the full digitized version. A major research library digitized pubs in it's reserve collection to make available to other libraries and the public, so I'm contacting the various library reserve folks to find out how to gain access to the entire publications. Most likely through the modern/digital interlibrary loan process. Also found a J Bulova ad from 1897 in a Jewelers Circular PDF. And a snippet of a company report from 1931 (published in mid 1932 as their fiscal year ended at the end of March) . I see American Standard Watch Case Co, along with American Standard Watch Co, (and many others) were subsidiary's of Bulova. The early 1920's reports may have info on Rubaiyat Watch Co, Hudson-Maxim, if they were owned by "Bulova". Several other subsidiaries are listed, but not coming up as a snippet view. Most of these subsidiaries were wholly owned by Bulova Watch Co after 1923 and J Bulova before- if we can just get the entire pub, we can see who/what Bulova "owned". There's a couple Rubaiyat patent comments above. One registered March 2, 1943- which must have been a reapplication for the original (below), as the application date is Oct 1942- apx 25 years after the original patent below. Great stuff, Will. Very interesting about the original Rubaiyat patent app. These Jewelers Circulars are a wealth of information. Great find Will. One of the scans above mentions the 'bracelet model of the Hudson Maxim"....let the games begin! Jewelers Circular July 19 1922. I wonder if Bulova employed the services of the good Sir Charles. I would not be suprised if they did. Yea they had the entire 10th floor. Wonder if this was the address of the observatory too. I dont remember. Fifth Ave at 36th St mentioned in the snippet above is the location of the 1905 Gorham building (392 Fifth Ave?). The address I have for the Bulova Observatory is 580 Fifth Ave on what's known today as the World Diamond Tower http://www.580worlddiamondtower.com/history.htm formerly known as the Empire Trust Company Building, which was the former Ampico Towers. The World Diamond Tower link gives a building permit issuance Date of 1927. No indication of a Date but typically when J. Bulova & Cie. is mentioned it's an older record. image above is of an 'Everett Watch Co. New York' Swiss Pocket Watch - 7 Jewels. "Having a circular dial, with Roman numeral chapters, subsidiary seconds dial, 7 jewel stem wind manual movement, having 2 adjustments, concealed within a yellow gold-filled hunting case #2138690. Signed on movement Factory S, Switzerland and on dial Everett Watch Co., New York. Movement size approximately 0". So the trademark or patent entry above was from the Mikrolisk.de Another good find. Must not had a date associated w/ the trademark entry. I bet we can find a date from other resources for trademarks. I hadn't noticed this before, but there are a few Bulova model names that exist that are both Bulova AND Westfield. ie: Air King, Air Queen, American Boy, American Girl, Sky King, Trojan, Miss Liberty, etc. I'm wondering if the cases are identical, and swapping has occurred. There is a lot of info at Mikrolisk, including what appears to be all of the Bulova Model name patents. It looks like Bulova patented/trademarked many model names and lots of stuff under different company names too. Many are non-USA registered. Many don't have dates associated w/ the info for each entry. I think they just registered things to secure the names/trademarks, and didn't necessarily "do anything" with some of them short of this. I don't think cases btwn Bulova and Westfield were identical or even "close", but Bulova wanted some options, and to keep others from marketing a competing product? I've searched the internet all Day for Everett Watch Co of New York and coming up blank - obviously they existed and were owned by J. Bulova & Cie.
Perhaps a search of the Swiss internet will produce better results. ...and now a watch size example. What year do you think this example is? 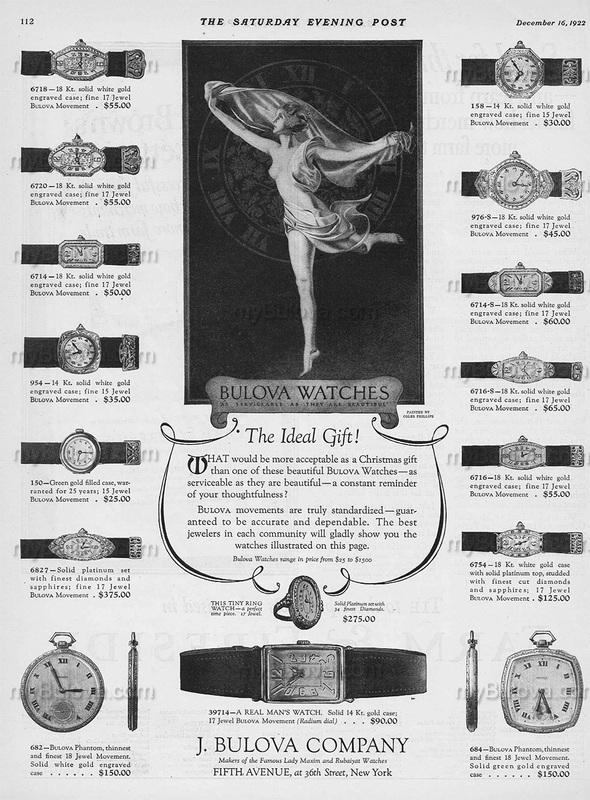 Considering the published information that 'Bulova introduced its first line of fully Jeweled Gent's wristwatches in 1919' and the "Makers of the famous Hudson Maxim Watches" statement in the fine print of the J. Bulova Co ad Dated 1922.